a competition entry for the new statens naturhistoriske museum in copenhagen, denmark. 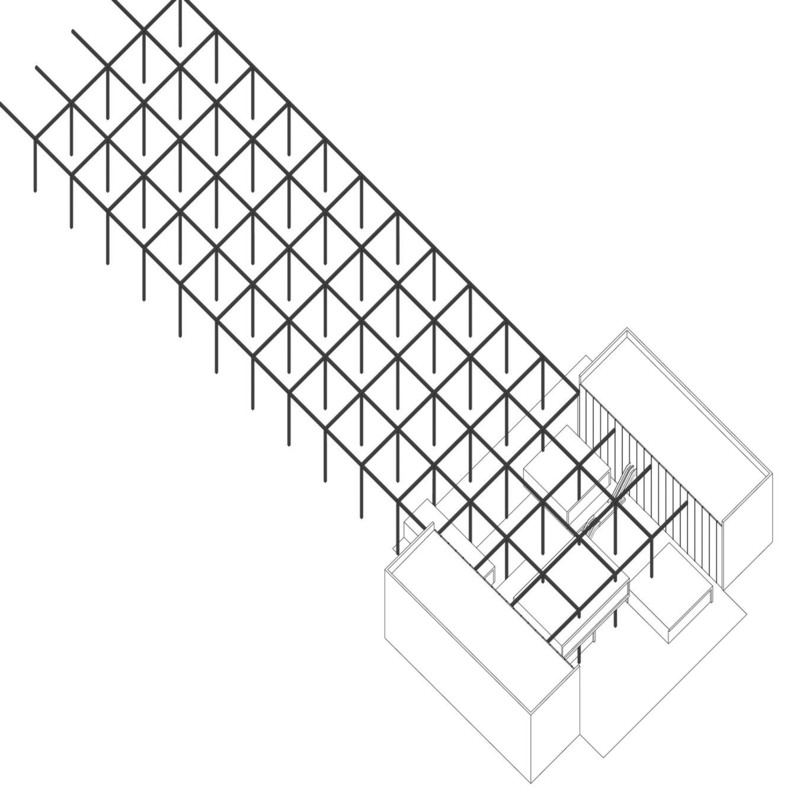 1 – axonometric of new museum and garden monument for statens naturhistoriske museum competition entry. the grid structure forms a continuous environment. the context is rendered uniform by technology, culture and other forms of imperial knowledge. 2 – museum collections and exhibits extend beyond the walls of the existing buildings. 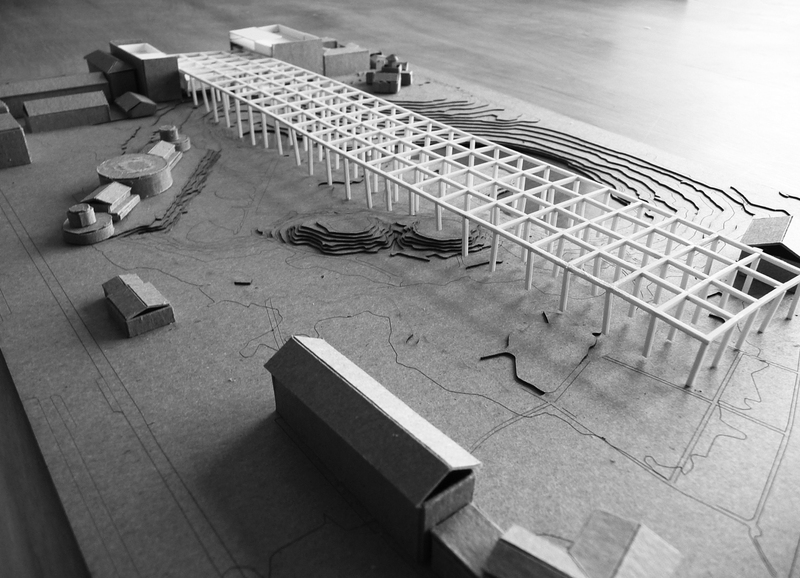 7 – the monumental garden infrastructure guarantees the legibility of the historical context and the institution, but the megastructure also invites its own decay. 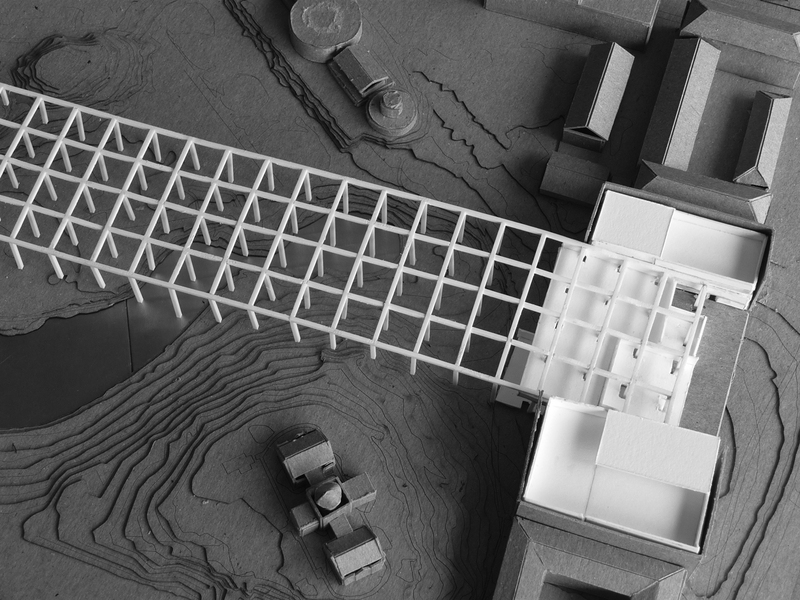 the proposal mixes the space requirements for the new museum facilities between the existing museum buildings and new areas of construction. the new construction areas are proposed as dense blocks of program that create a new threshold to the museum and the botanisk have beyond. 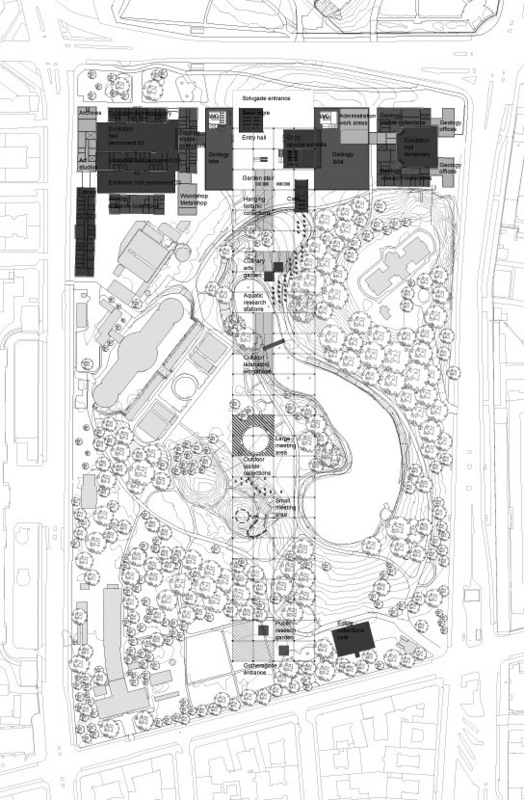 the building organization encourages interaction of program elements across the garden threshold to create an active entry hall that communicates the activity of the museum to street traffic and garden occupants. in the building section the layers of program elements create plates and volumes that project, hover and float into the main hall, interconnected by a system of escalators criss-crossing the open atrium. the botanisk museum, geologisk museum and sølvtorvskomplekset will be re-appropriated according to a new masterplan for the entire botanisk have complex. exterior courtyards in the geologisk museum and sølvtorvskomplekset will be enclosed in order to function as exhibition halls for the permanent collection of artifacts. as much as possible the original character of these building will stay intact as a contrast to the new extension construction. the entire botanisk have is considered as part of the statens naturhistoriske museum ground floor plan. the garden becomes a territory for re-connecting disparate parts of the current museum. with this in mind, the main entry to the museum complex is is located on gothersgade, a short walk from the nørreport metro, one of the most traveled spots in copenhagen. entry is established by a new garden monument structure that extends the entire length of the garden. the momument gathers and carries human activity across the landscape toward the sølvgade site and the parks beyond. as a hybrid of re-connected disciplines and museum activities, the garden erodes the walls of the museum buildings. the continuous garden monument initiates a new geography of use as the site of numerous museum events and exhibitions. the proposal emphasizes the type of urban street activity found in the gothersgade neighborhood – a pedestrian oriented street with lots of bike traffic. at the urban scale the garden monument suggests a literal or hypothetical connection to the statens kunst museum and surrounding park north of sølvgade.